Brecon Beacons area, S.Wales May 2012. 18 Apr 2012. © C.F.Carter (chris.carter@6cvw.freeuk.com). Published in: Lokhorst, G.M. & Star, W. (1985). Ultrastructure of mitosis and cytokinesis in Klebsormidium mucosum nov. comb., formerly Ulothrix verrucosa (Chlorophyta). Journal of Phycology 21: 466-476, 19 figs. The type species (holotype) of the genus Klebsormidium is Klebsormidium flaccidum (Kützing) P.C.Silva, K.R.Mattox & W.H.Blackwell. Type locality: Ro, Bornholm, Denmark (Lokhorst 1996: 34). Lectotype: 12 October 1912; road in plantation, on naked clay soil. C [herbarium specimen] annotated as "Hormidium mucosum n. sp. (Lokhorst 1996: 34). Notes: Lectotype designated by Lokhorst & Star (1985: 474). Strain SAG 8.96 was isolated by Lokhorst (original number KL 63) from soil near the water level of the river Dommel near Valkenswaard (the Netherlands). It is designated as epitype by Mikhailyuk et al. (2015: 764) to support the lectotype and is the authentic strain of K. mucosum (cryopreserved in liquid nitrogen in the SAG). Borisova, O.V. & Tsarenko, P.M. (2015 '2014'). Klebsormidiales. In: Algae of Ukraine: diversity, nomenclature, taxonomy, ecology and geography. Volume 4: Charophyta. (Tsarenko, P.M., Wasser, S.P. & Nevo, E. Eds), pp. 449-453. Ruggell: Koeltz Scientific Books. John, D.M. (2002). Orders Chaetophorales, Klebshormidiales, Microsporales, Ulotrichales. In: The Freshwater Algal Flora of the British Isles. 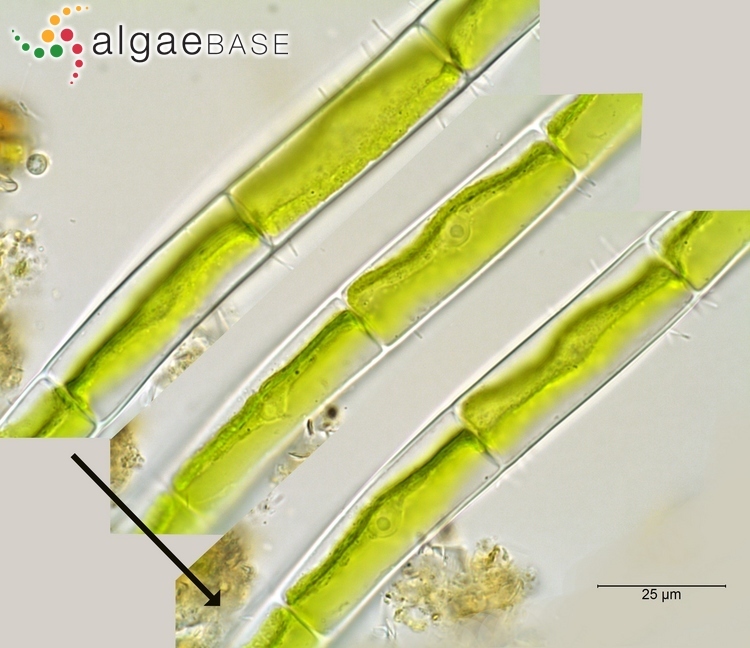 An identification guide to freshwater and terrestrial algae. (John, D.M., Whitton, B.A. & Brook, A.J. Eds), pp. 433-468. Cambridge: Cambridge University Press. Lokhorst, G.M. (1996). Comparative taxonomic studies on the genus Klebsormidium (Charophyceae) in Europe. Cryptogamic Studies Volume 5. pp. 1-132. Stuttgart: Gustav Fischer. Mikhailyuk, T., Glaser, K., Holzinger, A. & Karsten, U. (2015). Biodiversity of Klebsormidium (Streptophyta) from alpine biological soil crusts (Alps, Tyrol, Austria, and Italy). Journal of Phycology 51(4): 750-767. Rindi, F. (2011). Phylum Chlorophyta. Orders Klebsormidiales. In: The freshwater algal flora of the British Isles. 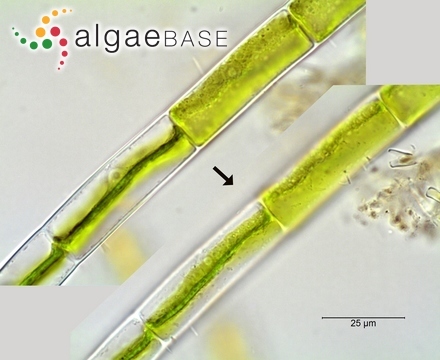 An identification guide to freshwater and terrestrial algae. Second edition. (John, D.M., Whitton, B.A. & Brook, A.J. Eds), pp. 554-556. Cambridge: Cambridge University Press. Sluiman, H.J., Guihal, C. & Mudimu, O. (2008). Assessing phylogenetic affinities and species delimitations in Klebsormidiales (Streptophyta): nuclear-encoded rDNA phylogenies and ITS secondary structure models in Klebsormidium, Hormidiella, and Entransia. Journal of Phycology 44(1): 183-195. Accesses: This record has been accessed by users 1203 times since it was created. Lokhorst, G.M. & Star, W. (1985). Ultrastructure of mitosis and cytokinesis in Klebsormidium mucosum nov. comb., formerly Ulothrix verrucosa (Chlorophyta). Journal of Phycology 21: 466-476, 19 figs.